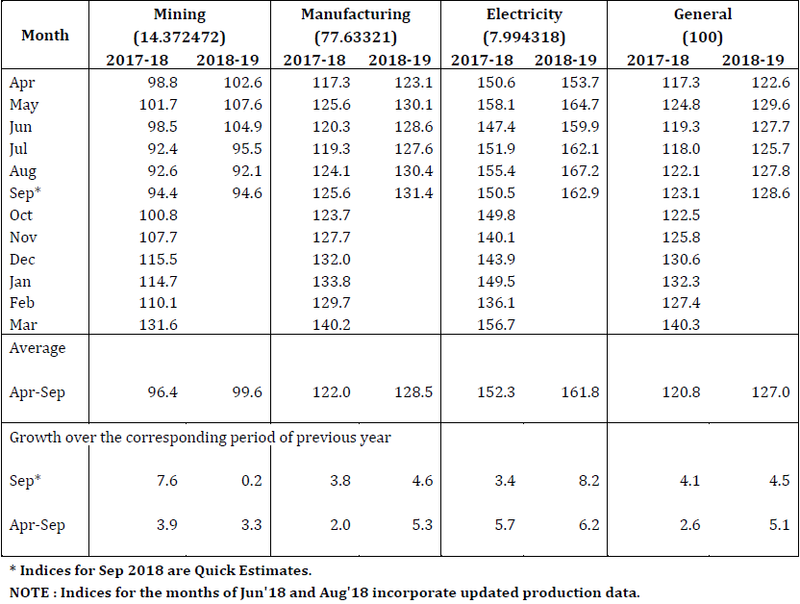 Nov 12, 2018: The Quick Estimates of Index of Industrial Production (IIP) with base 2011-12 for the month of September 2018 have been released by the Central Statistics Office of the Ministry of Statistics and Programme Implementation. 1. The Quick Estimates of Index of Industrial Production (IIP) with base 2011-12 for the month of September 2018 stands at 128.6, which is 4.5 percent higher as compared to the level in the month of September 2017. The cumulative growth for the period April-September 2018 over the corresponding period of the previous year stands at 5.1 percent. 2. The Indices of Industrial Production for the Mining, Manufacturing and Electricity sectors for the month of September 2018 stand at 94.6, 131.4 and 162.9 respectively, with the corresponding growth rates of 0.2 percent, 4.6 percent and 8.2 percent as compared to September 2017 (Statement I). The cumulative growth in these three sectors during April-September 2018 over the corresponding period of 2017 has been 3.3 percent, 5.3 percent and 6.2 percent respectively. 3. In terms of industries, seventeen out of the twenty three industry groups (as per 2-digit NIC-2008) in the manufacturing sector have shown positive growth during the month of September 2018 as compared to the corresponding month of the previous year (Statement II). 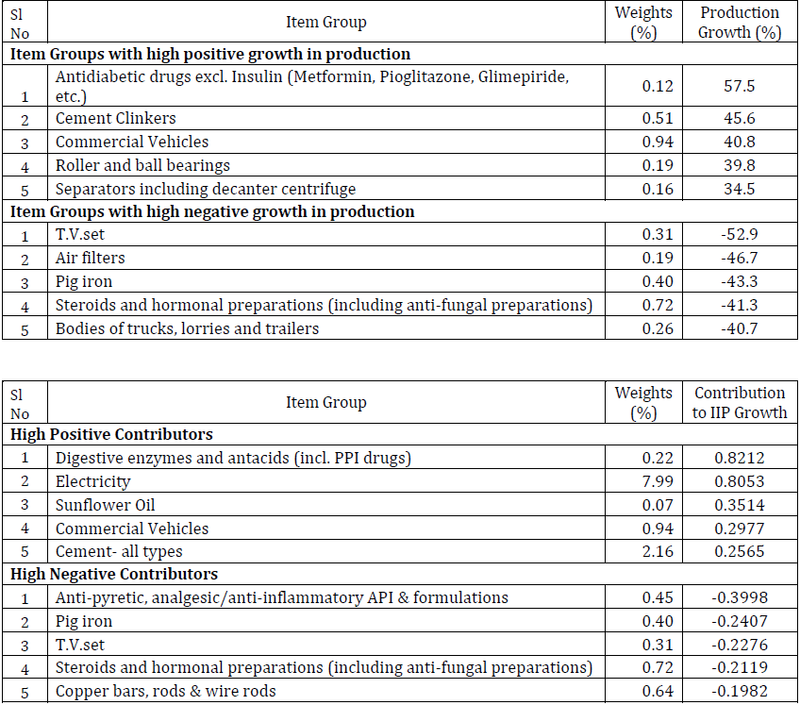 The industry group ‘Manufacture of furniture’ has shown the highest positive growth of 32.8 percent followed by 20.9 percent in ‘Manufacture of wearing apparel’ and 20.6 percent in ‘Manufacture of wood and products of wood and cork, except furniture; manufacture of articles of straw and plaiting materials’. On the other hand, the industry group ‘Printing and reproduction of recorded media’ have shown the highest negative growth of (-) 12.9 percent followed by (-) 10.7 percent in ‘Other manufacturing’ and (-) 7.3 percent in ‘Manufacture of tobacco products’. 4. 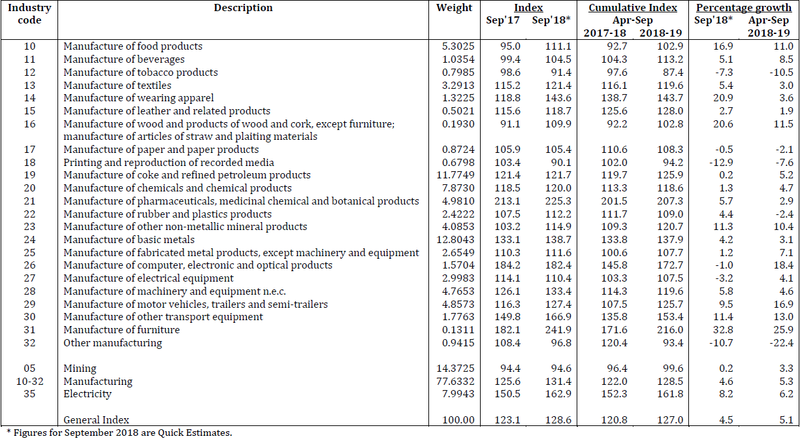 As per Use-based classification, the growth rates in September 2018 over September 2017 are 2.6 percent in Primary goods, 5.8 percent in Capital goods, 1.4 percent in Intermediate goods and 9.5 percent in Infrastructure/ Construction Goods (Statement III). The Consumer durables and Consumer non-durables have recorded growth of 5.2 percent and 6.1 percent respectively. 6. Along with the Quick Estimates of IIP for the month of September 2018, the indices for August 2018 have undergone the first revision and those for June 2018 have undergone the final revision in the light of the updated data received from the source agencies. 7. 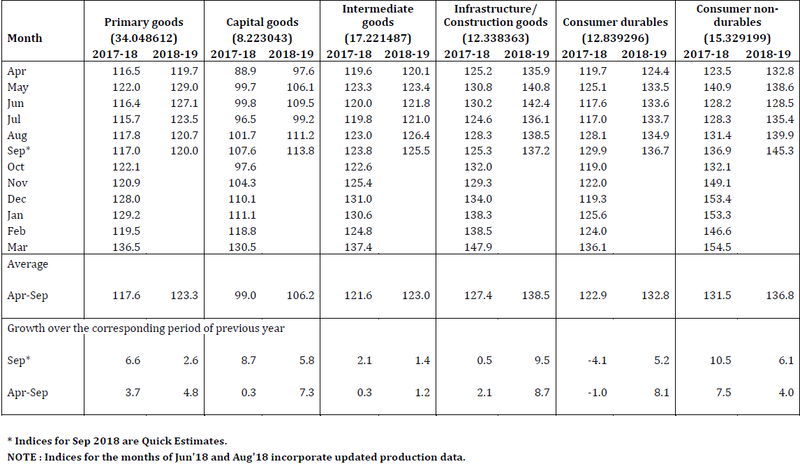 Statements giving Quick Estimates of the Index of Industrial Production at Sectoral, 2-digit level of National Industrial Classification (NIC-2008) and by Use-based classification for the month of September 2018, along with the growth rates over the corresponding month of the previous year including the cumulative indices are enclosed. 8. Release of the Index for October 2018 will be on Wednesday, 12 December 2018.